(CNN) -- Amnesty International has accused Hamas militants in Gaza of kidnapping, killing and torturing fellow Palestinians they accuse of spying for Israel, the organization announced Tuesday. 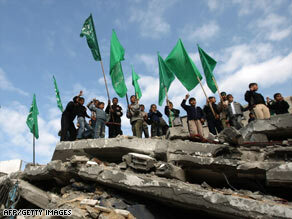 Hamas supporters stand on the rubble of a building hit by an Israeli strike that killed Hamas' interior minister. According to Amnesty International, at least 24 Palestinian men -- most of them civilians -- were shot and killed by Hamas gunmen during the recent Israeli offensive aimed at crippling the Hamas leadership in Gaza. "Scores of others have been shot in the legs, kneecapped or inflicted with other injuries intended to cause permanent disability," the human rights organization said in a news release. Amnesty said that the targets of "Hamas' deadly campaign" include prisoners who escaped from Gaza's central prison when Israeli forces bombed it in the initial days of the military conflict. Some prisoners injured in the Israeli bombing were "shot dead in the hospitals where they were receiving treatment," Amnesty said. "The perpetrators of these attacks did not conceal their weapons or keep a low profile, but, on the contrary, behaved in a carefree and confident -- almost ostentatious -- manner," it said. Other targets included former members of Palestinian Authority security forces and supporters of Palestinian Authority President Mahmoud Abbas' Fatah party. Most of those suspected of spying for Israel have been abducted from their homes and then "dumped -- dead or injured -- in isolated areas," according to Amnesty International. During the Gaza conflict, medical officials at Gaza City's main medical facility, Shifa Hospital, said injuries they witnessed were consistent with people being shot in the kneecaps, elbows, hands or feet. "They shot him at close range with a pistol," he said of one man. "His bones are shattered. They shot him point-blank in the foot. ... This was done by Hamas people." The other man, he said, was struck on his legs with a metal construction bar. "Four people were beating him," he said. A Hamas security source told CNN the shootings occurred because renegade gunmen took the law into their own hands. Ehad al-Ghossain, Hamas' Interior Ministry spokesman, said there was no official order within Hamas to carry out such shootings. "That's not us," al-Ghossain said. "Maybe some families who had problems in the past just wanted to shoot these people."